Ant-Man is one of the sillier entries in the Marvel Cinematic Universe, and that goes double for the science in it. (Yes, comic books in general consider the laws of physics to be more like guidelines, but Ant-Man takes the cake.) But it was still good enough to get a sequel: Ant-Man and the Wasp. In fact, I think the sequel was considerably better than the original. Also, be sure to stay all the way to the end of the credits. That last line is a doozy. Ant-Man and the Wasp finds our titular hero, Scott Lang, under house arrest for fighting on Captain America’s side (that is, against the government) in Civil War and forbidden from having any contact with Hank Pym, the inventor of the shrinking Ant-Man suit. But then, Scott has a mysterious vision of Pym’s wife, who was lost in the subatomic Quantum Realm years ago, and he secretly contacts Pym…who promptly kidnaps him. 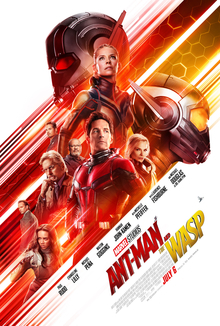 Pym and his daughter, Hope (the Wasp), are on the run for their own involvement in Civil War, but their shrinking technology makes it considerably easier for them. Pym is trying to build a “quantum tunnel” to recover his wife, and he thinks Scott is the key, hence the kidnapping. Except the technology is soon stolen by the mysterious Ghost, who walks through walls and wants it for her own…not so nefarious ends. And there’s a shady black market dealer who wants it too, because of course there is. So Scott has only two days to save Pym’s wife, stop Ghost and the black market guys, and get home before the FBI finds out he’s broken his house arrest. Easy-peasy. Now, it’s true, the science in this movie is silly even by comic book standards. Mass and density are whatever they need to be at the moment. Ghost keeps phasing in and out of a quantum superposition (or something). Quantum entanglement equals mental telepathy. (In the real world, it’s been proven that you can’t send messages with quantum entanglement.) And what did Janet eat and drink when she was trapped in the Quantum Realm for thirty years? Did she carve up molecules for food with her ax-looking thing? Or did she just survive on (rolls eyes) the “quantum healing particles”? Either answer only raises more questions. But I can accept all that because this is a movie that doesn’t take itself too seriously. It’s deliberately going for silliness, so why not embrace it? It’s a good story, better than the first one, and a worthy addition to the Marvel series to tide you over until Infinity War returns. This entry was posted in Movie Reviews and tagged Ant-Man, Ant-Man and the Wasp. Bookmark the permalink.